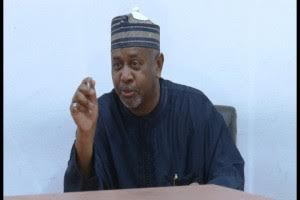 Former National Security Adviser (NSA), Col. Sambo Dasuki (rtd), has denied ever making statement implicating anyone or group in the allegation of $2billion arms purchase deal brought against him by the federal government. Dasuki, who spoke through his lawyer, Mr. Ahmed Raji, a senior advocate said he never made such statement or name anyone to EFCC and wondered ‎where the authors got their information from. “I was with Dasuki yesterday and wish to make categorical statement that my client never made any statement of such nature or naming anybody or group in any statement. “Quote me anywhere, Dasuki has not done anything like that. It is absolutely untrue. It is the figment of the imagination of the authors aimed at creating falsehood for reasons best known to them and Nigerians shou‎ld disregard them. “They are just out to scandalise the man, bring his image and character into disrepute so that his friends and well wishers can run away from him. “All over the world, there are lots of expenditures of national security and sensitive matters that are not ridiculed in the Press.” During today’s proceedings in court, the federal government appointed a private legal practitioner, Mr. Oladipupo Okpeseyitan, SAN, to prosecute Dasuki. Okpeseyitan after announcing his appearance told the trial judge, Justice Adeniyi Ademola that he had filed a motion for stay of execution of the ruling of the court which granted Dasuki permission to seek medical treatment. He applied to the court to put the ruling on hold pending the outcome of the appeal in the matter. Raji in his reply told the court that he had just been served with the motion in court, adding that he needed time to respond to the motion. The case has been fixed for December 8, 2015 for hearing.